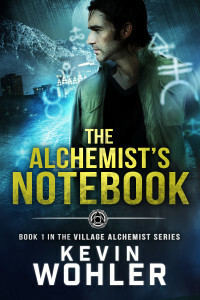 Coming this spring, Bottle Cap Publishing will release Kevin Wohler’s debut novel, The Alchemist’s Notebook, Book 1 of The Village Alchemist series. Recently, we finalized this fantastic cover, designed by Clarissa at Yocla Designs. The Alchemist’s Notebook is the first book in The Village Alchemist series. It is scheduled to debut on Amazon.com in May, and will be available in ebook and print format.